Citation: Saraçlar, Murat. Turkish Broadcast News Speech and Transcripts LDC2012S06. DVD. Philadelphia: Linguistic Data Consortium, 2012. Turkish Broadcast News Speech and Transcripts was developed by Bogaziçi University, Istanbul, Turkey and contains approximatley 130 hours of Voice of America (VOA) Turkish radio broadcasts and corresponding transcripts. 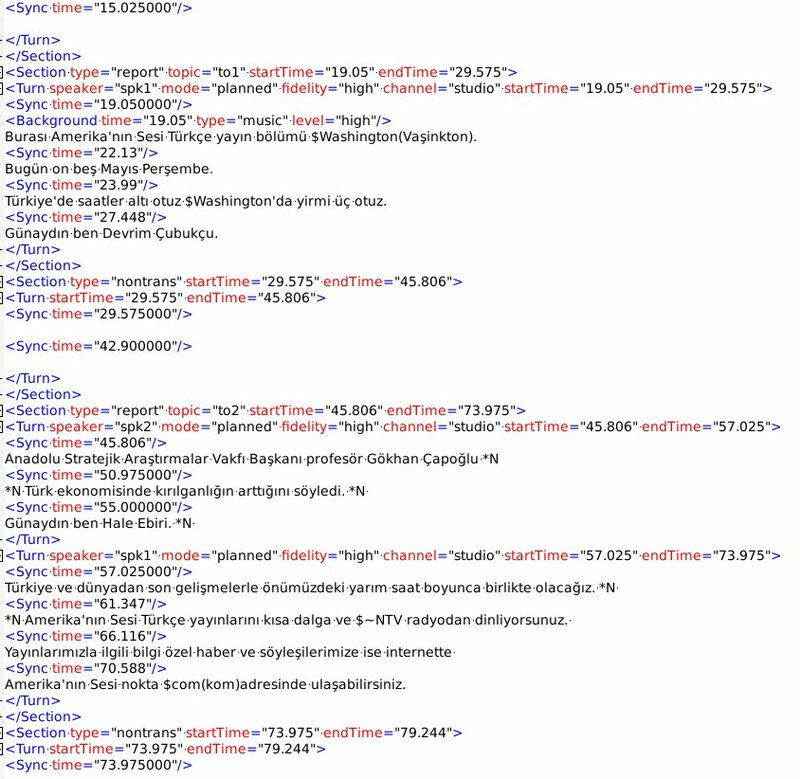 This is part of a larger corpus of Turkish broadcast news data collected and transcribed with the goal to facilitate research in Turkish automatic speech recognition and its applications, such as speech retrieval. The VOA material was collected between December 2006 and June 2009 using a PC and TV/radio card setup. The data collected during the period 2006-2008 was recorded from analog FM radio the 2009 broadcasts were recorded from digitial satellite transmissions. A quick manual segmentation and transcription approach was followed. Speech recognition and retrieval experiments using the larger corpus can be found in the following journal article: Ebru Arisoy, Dogan Can, Siddika Parlak, Hasim Sak, and Murat Saraclar, Turkish Broadcast News Speech and Transcripts Transcription and Retrieval, IEEE Transactions on Audio, Speech and Language Processing, 17(5):874-883, July 2009. For more information please visit http://busim.ee.boun.edu.tr/~speech or contact the principal investigator, Murat Saraçlar. The data was recrded at 32 kHz and resampled at 16 kHz. After screening for recording quality, the files were segmented, transcribed, and verified. The segmentation occurred in two steps, an initial automatic segmentation followed by manual correction and annotation which included information such as background conditions and speaker boundaries. The transcription guidelines were adapted from the LDC HUB4 and quick transcription guidelines. An English version of the adapted guidelines is provided with the data here. The manual segmentations and transcripts were created by native Turkish speakers at Bo?aziçi University using Transcriber. The transcriptions are provided in the ISO-8859-9 (Latin5) character set. Funding for this corpus collection effort came from TUBITAK Project 105E102 and Bogazici University Research Fund Project 05HA202.